You have the chance to upgrade your “GrillFriend” by sending us a photo of you with your current grill on KXLY. 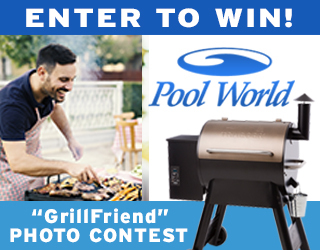 After the photo entry period, a voting period will begin to select the winner of a new Traeger Pro22 from Pool World! Plus! every photo entry gets a valuable coupon for a Free Traeger Spice to season your favorite grilled grub. A perfect way to kick-off the summer grilling season! This contest is open to anyone over the age of 18, male or female may participate. Other restrictions may apply, contact Pool World or see contest rules for details. Must enter by June 17th.